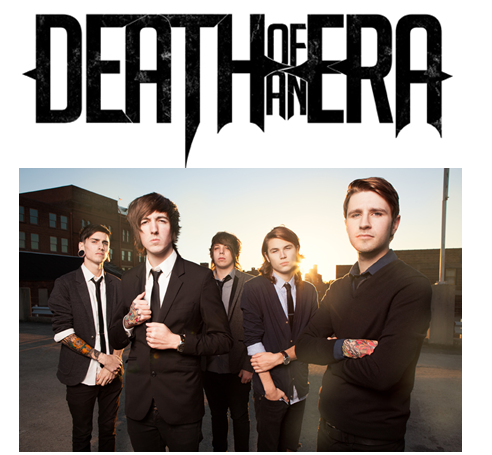 (New York, NY) – Death of an Era’s new EP The Great Commonwealth is out today(Artery Recordings/Razor & Tie) – on iTunes HERE (http://bit.ly/DOAEiTunes). The Great Commonwealth EP was produced by Kevin Lankford. Formed last year, the Columbus, OH based death metal band Death of an Era is the latest addition to join the Artery Recordings, the joint venture between The Artery Foundation and Razor & Tie. After a year supporting their self-released Reviler EP, this collective of high school friends had risen out of the Ohio underground and into the national spotlight. Alternative Press featured them in AP&R, and they carved out a rabid core of fans through relentless touring and an incomparable sound. Confronting everything from child abuse and drug addiction to deceit and bullying head-on, the group—Daniel Simpson [vocals], Nathan Stewart [guitar], Dustin Colling [guitar], and brothers Chris [bass] and Michael Cooper [drums]—offer catharsis in the face of chaos. This entry was posted in Artist, Bassists, Drummer, Guitarists, Heavy metal, Internet Radio, Metal, Music, Rock, Rock N' Roll, RockStar, Surrealist, Thrash Metal and tagged Artery Recordings, Bleach Bang, Bleach Bangs, Bleach Bangs Radio, Charlie Owens, Chris Cooper, Daniel Simpson, Death Metal, Death Of An Era, Dustin Colling, Hard Rock, Heavy Metal, Metal, Michael Cooper, Music, Nathan Stewart, Randy Norris, Razor & Tie, Rock, Rock N' Roll, Rock Star, RockStar, The Artery Foundation, the Hellion, the Hellion Rocks. Bookmark the permalink.